Yussef al-Ahmad, Syria's ambassador to the Arab League, is surrounded by cameramen during the Arab League emergency session on Syria at the Arab League headquarters in Cairo, Egypt, Saturday, Nov.12, 2011 . 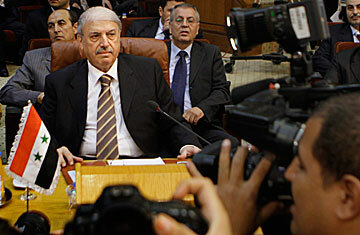 The Arab League has voted to suspend Syria from all meetings until it implements plan to end bloodshed. Syria appears to have lost its political cover from the Arab world. Damascus, the self-declared beating heart of pan-Arab nationalism, was suspended from the 22-member Arab League on Saturday. It was an unusually bold move by a body not known for achieving consensus or results, especially on the divisive issue of Syria's handling of its ferocious eight-month-old crackdown on pro-democracy supporters. In a stronger than expected move, 18 states approved the suspension, which will take effect on Nov. 16, when the League will meet again in Morocco to discuss Syria's compliance (or lack of) on its latest demands. Iraq abstained, a move some observers interpreted as a measure of Iran's influence over Baghdad. Iran remains Syria's staunchest ally in the region, but Saturday's vote clearly shows that both Tehran and Damascus have become pariahs in their neighborhood. Yemen, battling its own pro-democracy movement, objected to the suspension, as did Syria's smaller, weaker neighbor Lebanon, which shook off Damascus' 29-year occupation back in 2005, but now appears to be firmly back in Syria's grip. The League also decided to impose political and economic sanctions against Damascus, and urged its member states to withdraw their ambassadors from the Syrian capital in protest. "Syria is a dear country for all of us and it pains us to make this decision," Qatari Foreign Minister Hamad bin Jassim al-Thani told a news conference at the League headquarters in Cairo. "We hope there will be a brave move from Syria to stop the violence and begin a real dialogue toward real reform." With its surprising decisiveness, the league managed to repair a measure of its credibility, badly damaged after Syrian President Bashar al-Assad had made a mockery out of a supposed agreement with the League announced just 10 days ago. Under the terms of that deal, Assad was supposed to withdraw his security forces from Syria's besieged cities, stop violence, free all political detainees, hold a national dialogue with the Syrian opposition within two weeks, and to allow media, the Arab League and international monitors access to the closed country. He didn't do any of that. Instead, more than 100 people were killed in the tormented central city of Homs alone since the "deal" was announced on Nov. 2, according to a Human Rights Watch report issued this week. HRW has accused the Syrian regime of committing crimes against humanity in Homs. Syria will be excluded from the pan-Arab body until it implements the terms of this earlier agreement. "We were criticized for taking a long time but this was out of our concern for Syria," Qatari Foreign Minister Thani said of the perceived foot-dragging on censuring Syria. "We needed to have a majority to approve those decisions." The concern, of course, is that instability in Syria, particularly of a sectarian nature, could surge across its borders and ignite similar sectarian conflict in the patchwork societies of Iraq and Lebanon as well as foment trouble in Jordan and Israel, perhaps through Syria's militant allies, the Lebanese group Hizballah and the Palestinian Hamas organization. Still, despite these fears, Arab League Secretary General Nabil Araby suggested that the body had run out of patience with Assad. "The Arab League started asking Syria four months ago to stop this killing, but without a response," he said, later adding that "Assad can stop the killing in four days, we've been asking him to do so for four months." Predictably, Syria's representative to the Arab League, Youssef al-Ahmad, slammed the body's "illegal" decision, describing it as a violation of its charter and an indication that it served a Western and U.S agenda, the state-run Syrian news agency reported. In an undiplomatic moment, he also allegedly called Araby and Thani "pigs and traitors," according to Arabic satellite channels. Name-calling and finger pointing aside, the question is what happens next? The Qatari foreign minister urged Syria's fragmented opposition to meet in Cairo over the next three days "to discuss how they can have one opinion." The Syrian National Council (SNC) was recently formed as an umbrella organization, but it has been marred by infighting and breakaways. Although the SNC has yet to be recognized by most states (apart from Libya's new leaders), the Arab League went further than it has gone before in anointing the Syrian opposition council as the legitimate representatives of the opposition. "This is if everything goes okay," Thani added. "If the killing stops. But if the killing doesn't stop, we have to come back and see where we are going." That may include seeking assistance from the United Nations to help rein in Assad, a move that could echo international military action against Libya's Colonel Muammar Gadhafi. But once again, the League shied away from the specifics, although Thani stressed that arming the Syrian opposition was not on the table  for now. "Nobody in the League is talking about arming [the opposition], or creating a no-fly zone. Not one member mentioned these. The mechanisms will be considered on the 16th." Will the international community  specifically Russia and China, which have prevented a U.N resolution against Syria  now take cues from the Arab League and move more firmly against Assad? That remains to be seen. But one thing is definitely clear: the Arab deadlines are becoming shorter. Syria's Baathist regime  which has been in power for five decades  now has four days to act.